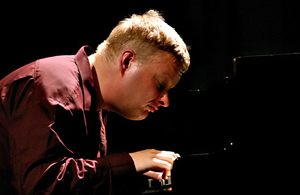 Born 1970 in Sipoo, Iiro Rantala studied piano in the jazz department the Sibelius Academy in Helsinki and classical piano at the Manhattan School of Music in New York. He is regarded as internationally one of the most prominent Finnish jazz musicians. He acts as a composer and performer with Trio Töykeät, Finland's most famous jazz band. Exploring the boundaries between musical genres is characteristic of Iiro Rantala's artistic personality. He has appeared in Finland with symphony orchestras, performing the Cartoon Concerto by Riku Niemi and Rhapsody in Blue by Gershwin. Iiro Rantala has also composed some pieces of classical music, most notably the Concerto for Piano and Concerto in G♯ΔA♭ (ODE 1071-2).